I am an USA RN BSN with 15 years experienced wishing to work in the MIddle East...Saudi, UAE, Qatar. I need info on employment agencies, current pay, benefits, and best places to work. Thanks in advance! P.S. Social skills are indeed needed in the OR. Even after the patient is asleep, there is team work. That is exactly why I posted this article. So often we simply look up the policy and believe that will cover our actions or we advise posters on this board to consult the policy & procedure manual at their facility and think this will envelope them in a blanket of safety. Yep, I am mistaken! 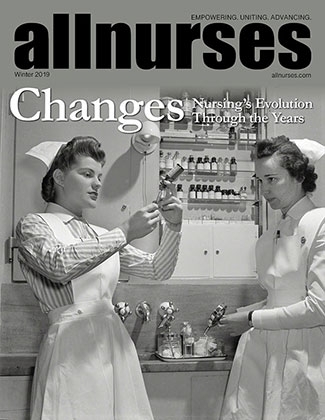 LegalPad From the 8/05 issue of Update for Nurses Negligence occurs when a nurse fails to follow the "standard of care." Although nurses often use this term to describe their normal practice, this term has a very specific legal meaning. The legal definition of "standard of care" is the basic level of care that is required of a reasonable and prudent nurse in similar situations. It is not the highest level of care, and it is not a regional or hospital specific standard. The standard of care is a national standard. Therefore, your care will be compared to that of other nurses nationally. In other words, it is not OK to say "that's the way we've always done it." If national standards and guidelines exist, your care will be compared to them. So, even following your hospital policies and procedures will not avoid negligence, because they may be deemed as below the national standard of care as well. The best way to maintain a practice that meets the standard of care is to keep up to date using national resources and to become involved in hospital policy reviews to assure that you are practicing at a level that meets current standards. Who remove non-implanted dialysis catheters? Here, pulling a temp dialysis catheter is a nursing function. The policy is the same for a central line. Best wishes. As long as you are giving the preferred professional notice of one month, leaving for new a experience to futher enhance your training and skills is a perfect answer. Best wishes in your continuing career! I have known nurses who have pinned their rings to hospital scrubs, forgot and lost them to the hospital linen service. I turn the the setting toward my palm when applying my gloves and never have a problem. They didn't teach me this in nursing school and I could have killed someone! I assume you are speaking of lipids causing a foreign body embolism or more specifically a fatty embolus. TPN can cause a gaseous embolism if combined with chemically incompatible substances. you can go to your profile and click on the threads you have started and commented on: 1. Quick links 2. My profile 3. Threads or left click on another posters name to go to their profile and find the threads in which they have participated. according to my iv drug administration book by mosby, there are physical and chemical incompatibilities. these can cause precipitation and gas evolution in drug mixtures. temperature can also affect solubility and compatibility along with ph and even the rate of administration. i take this to mean an air embolism or gas evolution can occur if incompatible chemicals are mixed in the same lumen. i have never heard of a problem if using different lumens. i flush before and after each piggyback to check for patency and maintain the integrity of the lumen. this also prevents incompatibility problems. in general, i do not piggyback drugs in tpn because of the high risk of infection along with the other incompatibility factors. if i have a doubt, i call the pharmacy and document their instuctions.